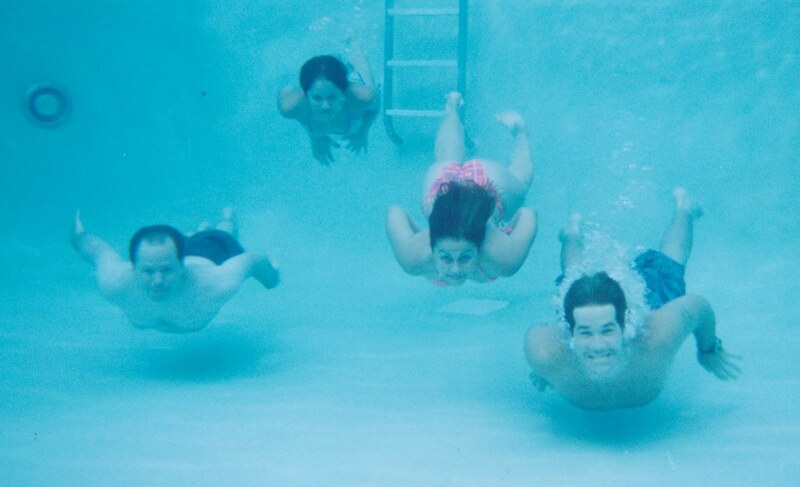 Before I had my waterproof digital, some friends and I would fool around…er, excuse me, *pool* around with a waterproof disposable camera at my apartment pool, laughing at crazy faces and hair flying every direction while trying to keep our eyes open. 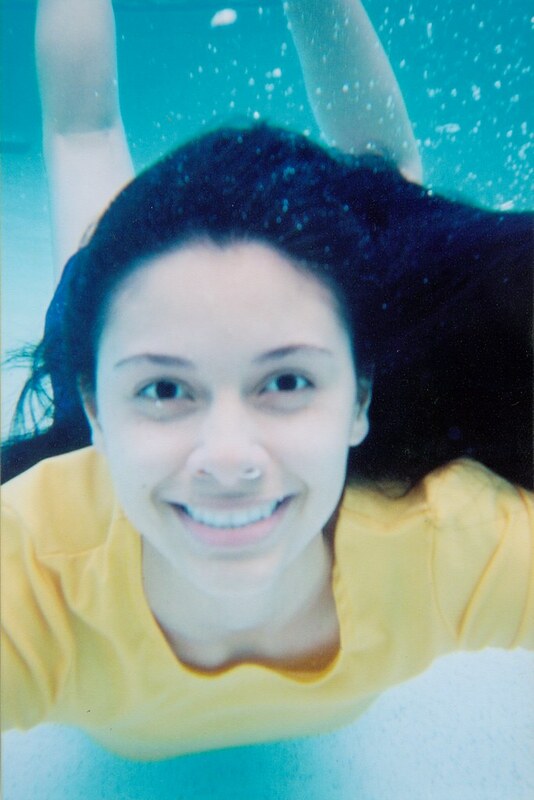 The first eight photos are from 2001 and was the very first time I'd ever used a waterproof camera. Not bad, considering no one had goggles and we were all tired from a beach trip and using the pool to just clean off and relax. 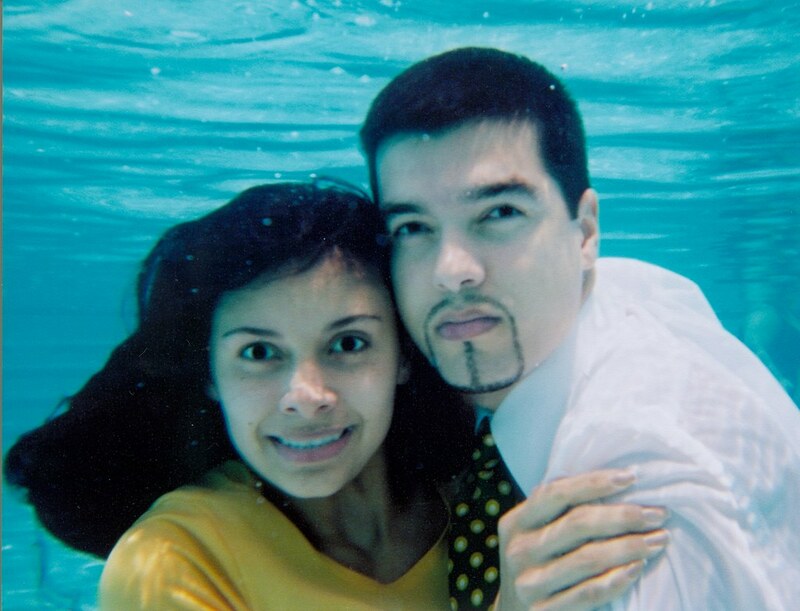 The next 13 were in 2002 shortly before the wedding of my friends, Luis and Marisol, who loved crazy photos and wanted to do this as their engagement photo session. 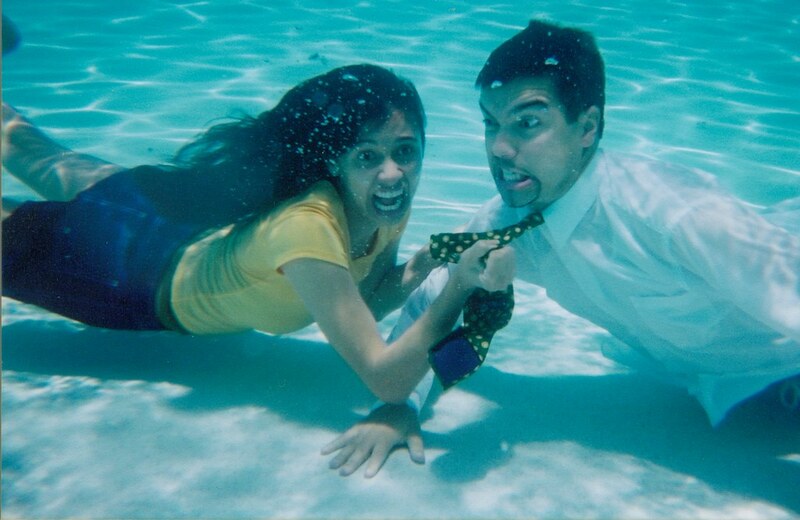 The last 25 from 2003 was jokingly branded "Spanish Weeki Wachee" by other friends who later saw the photos. 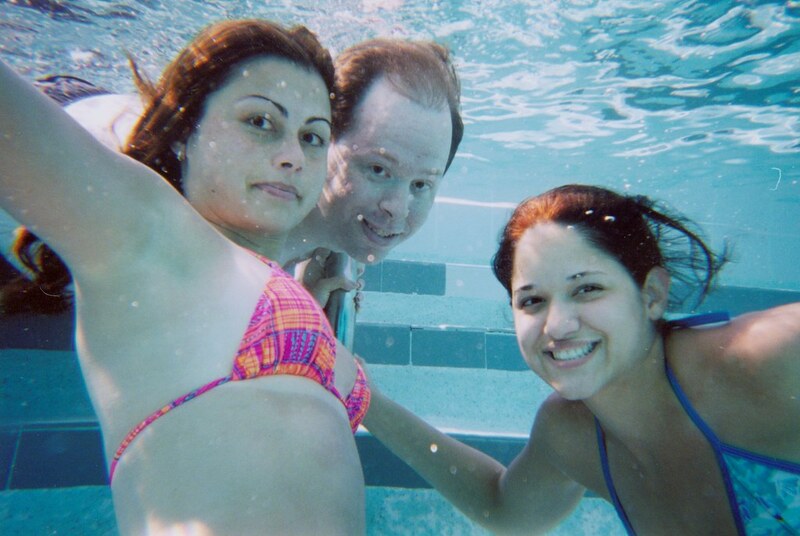 The first time we used a camera in the pool, we were cracking up so hard, it's amazing we managed to pull off any shots at all. The only poses we came up with basically just consisted of "sink and smile." We got a little more creative the next time. 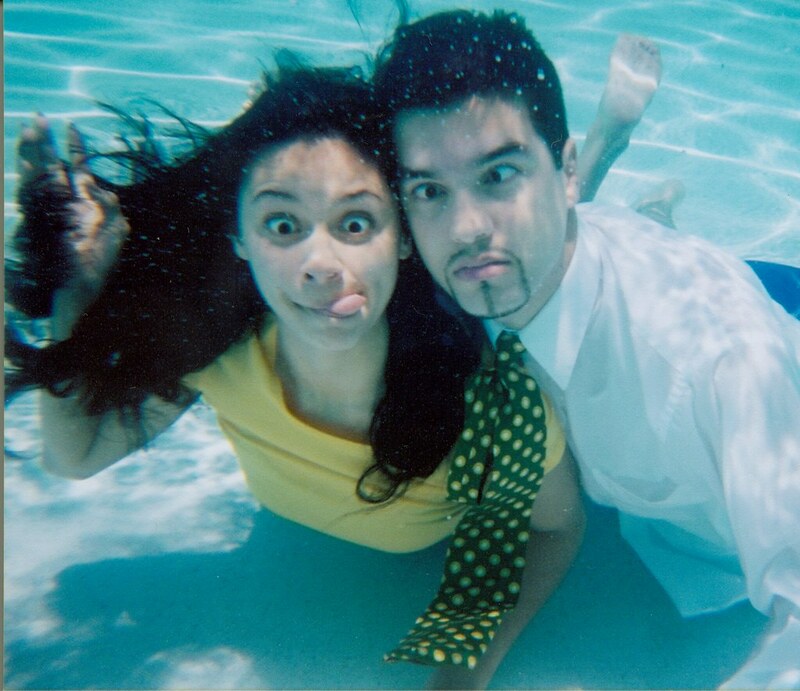 A silly engagement photo session for a couple who loves silly photos. Of all the shots we tried, this was supposed to have been the desired pose. None of the attempts for this pose ended up the way we hoped. For example, here, Luis closed his eyes. The other attempts resembled this one. Luis started looking okay, but Marisol got bug-eyed and seems to be about to burst a vein! Haha. 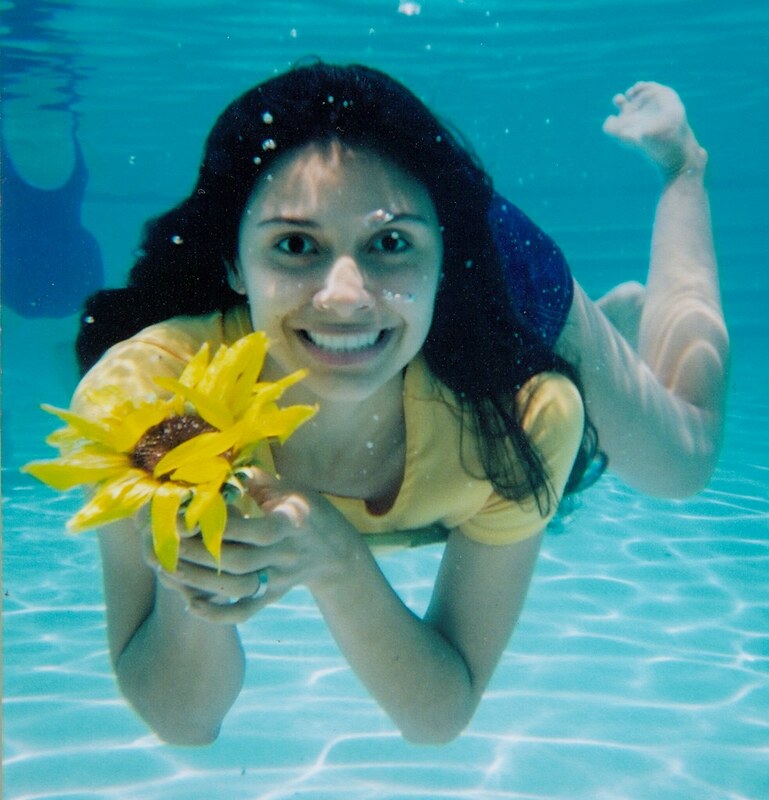 Naturally, we tried for this pose first because we weren't sure how long the sunflower would hold up underwater. We were right, it started disintegrating. In hindsight, we should've tried a couple shots before using the flower to give them time to get comfortable in the water. Fortunately, we were able to get one great shot of just Marisol with her flower before half the flower ended up as individual floating petals. (Oh okay, it would have been better still if I'd realized someone else was off in the background.) 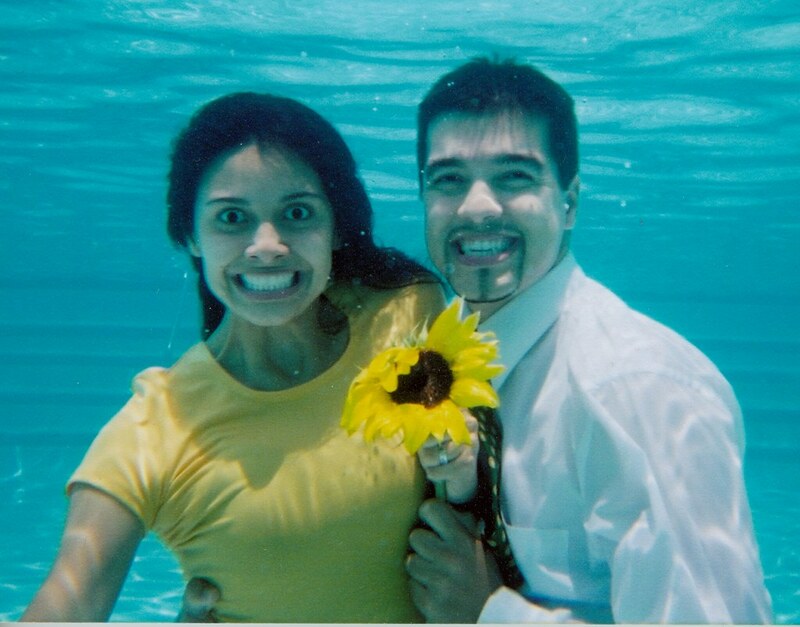 Yes, as a matter of fact, Marisol loves sunflowers and the church was full of them on the wedding day. One of the more adorable poses. One of the last action shots before they got tired and wanted to finish the roll with shots that required less energy! We tried for some serious expressions, but Marisol either grinned or closed her eyes. The one shot where she did neither came out looking like floating zombies (and a bit too dark to scan)! Were it not for how well the last photo in this batch turned out and that Marisol decided Luis needed a good choking (*laff*), this shot was nearly my favorite. 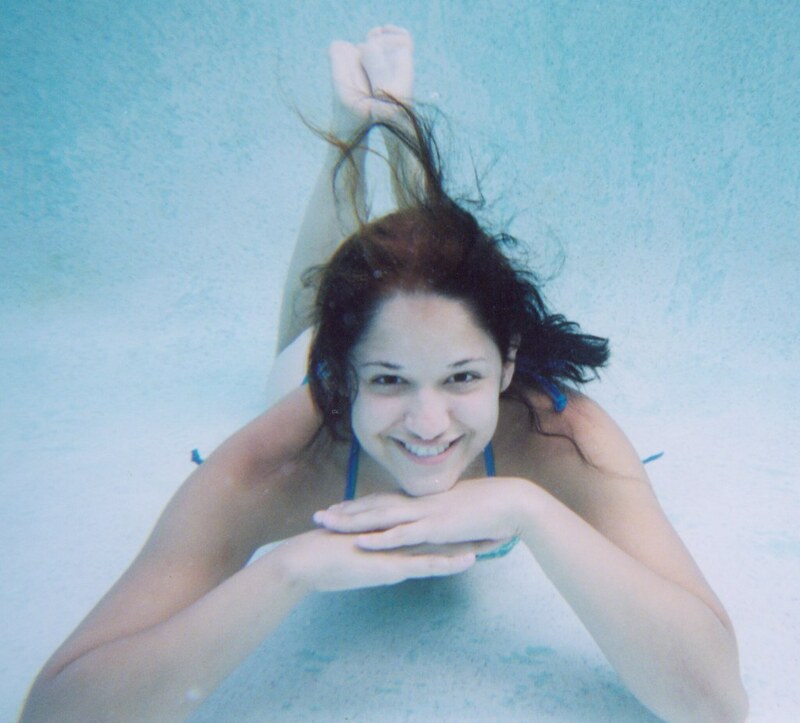 Trying for some individual closeups, I now have a tip for disposable underwater camera use: pay attention to the message that says your subject should be at least three feet away. It's the truth. Any closer and stuff gets a little blurry. The other shot I took like this was from about a foot or two distance and resembled what Marisol was seeing without a mask. Luis decided to be a bit more goofy for his closeups. 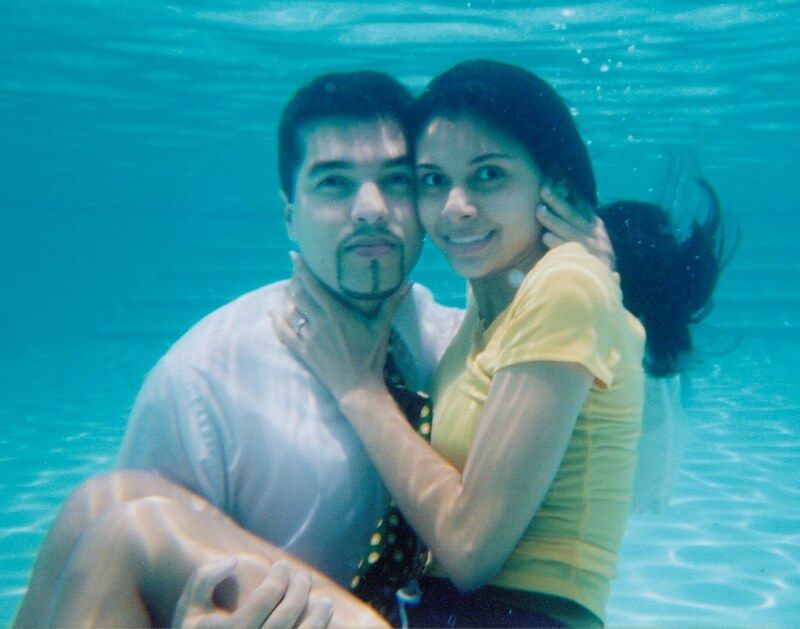 Marisol isn't about to let Luis hoard all the fun as she swims to him and lets out some anxiety! HAH! Such goofballs. Great shot, though. Saving the best for last, this was the "money" shot. None of us were sure it would turn out well when I told them to do this pose but it, by far, was the best. Marisol liked it so much, she had an 8x10 made of it for the reception photo table. 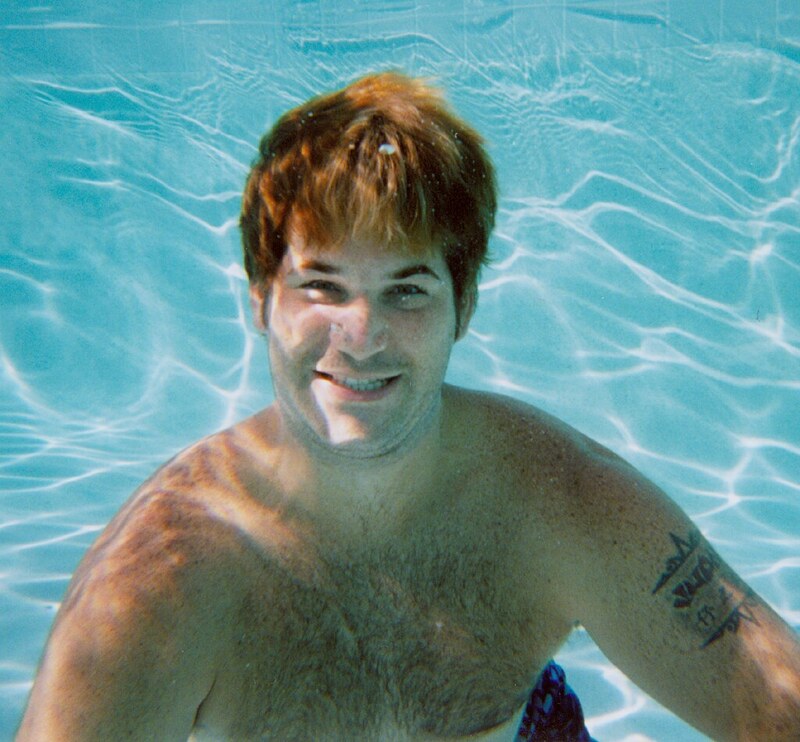 I'd asked a coworker to take a couple disposable cameras to our annual Wet 'n Wild private party to get shots to use in the youth publications. I feel bad she got kind of sick and was never able to use the cameras, but my gang got to have fun with one of them, being our usual goofy selves. Rosa says, "Talk to the hand!" Finally got our act together, sort of. Juan's kinda out there in the south 40. Attack of the aquatic life forms. The attack is interrupted by a silly photo op. The aquatic life form attack never had a chance of success. The army was more interested in trying to be Vogue, and Sylvia discovered the beauty of bubble mustaches. Juan took the camera and tried for a shot of Rosa and Sylvia. The first attempt didn't work out so great. Juan's second attempt was better, in spite of my photobomb. No idea what this was supposed to be. Crawling down the steps? Nice turban hair. Sylvia seems to have gotten amused. A little water refraction helps create an E.T. impersonation. Many people see shapes of objects in the clouds. I see them in bubbles! 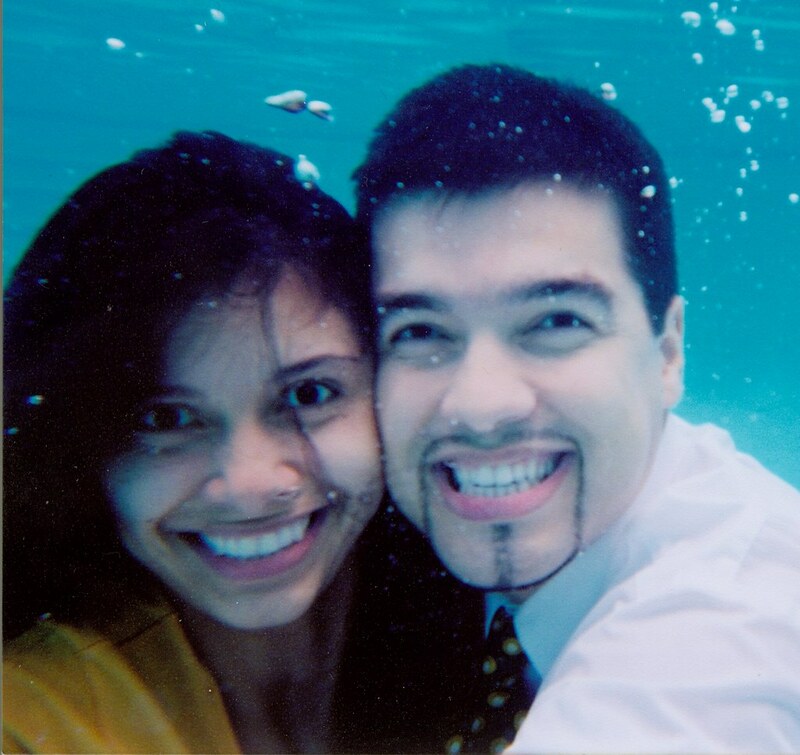 …Rosa couldn't resist swimming down to join Juan for a surprise couple's shot. A foot is growing out of his neck. Rosa doesn't like this photo, but it's her own fault. 🙂 It was supposed to be an underwater race to the other end, but she cheated and stayed on the surface. 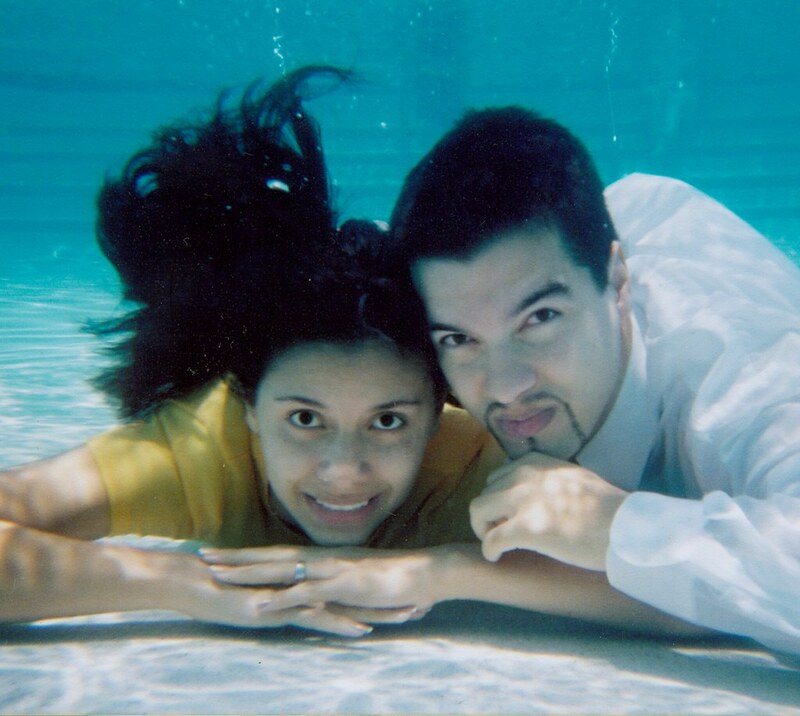 Recalling how well the laying-down shot of Luis and Marisol turned out from last year, I asked Rosa to give it a try. 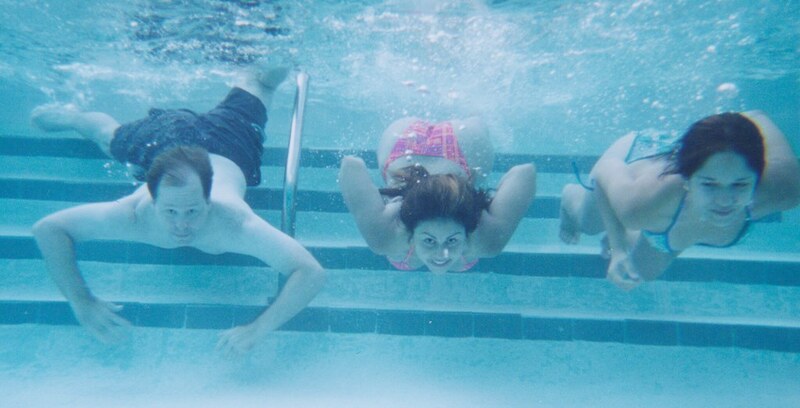 I kept forgetting that shots from the old disposable waterproof cameras come out a bit blurry if I got too close. 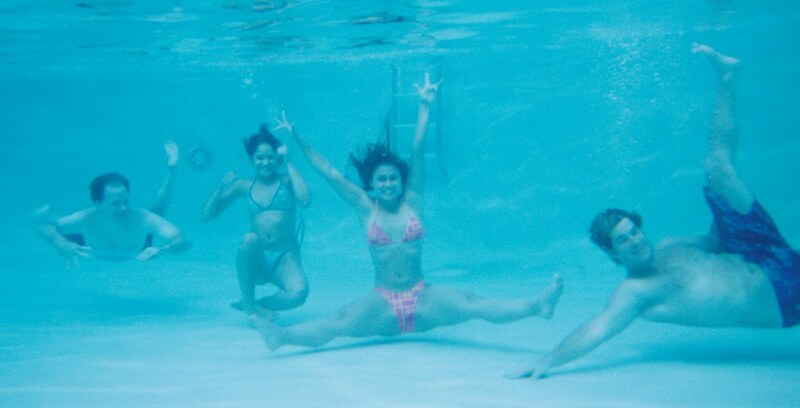 Not to be outdone, Sylvia gives the pose a try and actually manages to get all the way to the bottom of the pool. I thought Sylvia had closed her eyes on the previous photo, so I took another. As it happens, the first one is better. Lookin' very relaxed. 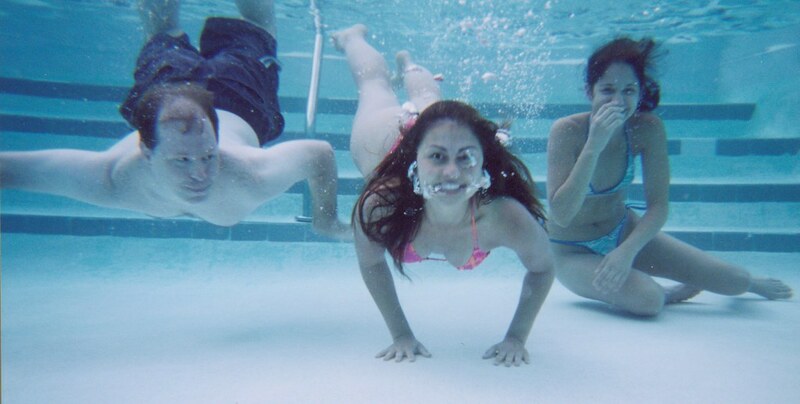 Hardly seems they're underwater in this one. I knew I'd shot too much headroom in the previous photo, so I took another. Better expressions in the first, I think. Wow, what a natural! Maybe someone oughta consider a modeling career—above or below! Juan shot this one a bit too early—Sylvia hadn't yet reached the bottom. Sylvia goes for one last great pose while the fish in the pink bikini tries to steal the show.